A Russian gulag does not make for cozy living. In the middle of the cold Siberian hellscape, the camp commander reminds the prisoners that the compound isn’t their prison: the environment is. A handful of prisoners decide to make a break for it, and what starts off as a gritty escape film devolves ludicrousness. Seven prisoners, including Ed Harris, Colin Farrell, and Jim Sturgess, escape from the prison only to face the bitter elements. Starvation, dehydration, and trench foot plague the party as they try to escape Stalinist rule to nearby Mongolia. The attached poster serves as a symbolic representation of the film. You don’t see any Russian gulags, just the faces of some notable stars with someone triumphantly reaching the top of a hill before everyone else. The main problem is that the film consists of two different beasts, the weaker being the one shown in the poster. The first half is a messy, painful journey to Mongolia. But as soon as the young Irena (Saoirse Ronan) crashes the all-male party, she softens the hearts of the men as well as the film’s whole tone. The premise that the girl escaped from a collective farm to go along with the gents feels less like an organic part of the plot and more like a naked attempt to pull at some heart-strings in the audience. The first half of the film is commendable for showing the scope and nastiness (in terms of both the amenities and some of the inmates) of the camp. Ed Harris’ gruff American attitude as Mr. Smith adds tough guy flavor and there’s real vileness in Colin Farrell’s convincing role as Russian criminal Valka. The film also tries to use as much Russian as possible and where not, at least uses Russian accents. The British-accented portrayal of Nazis in Valkyrie it ain’t. Other than that, it’s a bad film since it never knows what theme it wants to pursue. Check out Van Diemen’s Land if you want a gritty escape picture without the insipid fluff. *Once the men reach India, I thought to myself, “Everyone’s so joyful, they might as well have the wife randomly be there to greet them.” Imagine my surprise when, in a roundabout manner, they did just that by having Janusz get back to his wife via a few minutes of montage. Why not just leave it hanging on the note, “I’m going to get back to my wife….”? 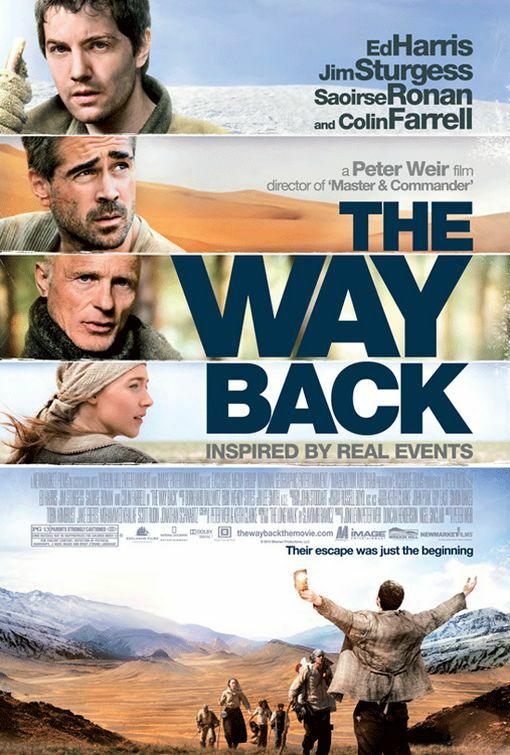 This entry was posted in Reviews and tagged Colin Farrell, Ed Harris, Peter Weir, The Way Back. Bookmark the permalink.